This extremely useful ‘transitional reader’ contains, at its core, eleven short passages selected from books one, two, and four of Vergil’s *Aeneid. * This small number of lines (about 200) is sufficient to accomplish the purposes of the book: as the foreword (by Kenneth Kitchell) explains, the LEGAMUS transitional readers are intended not to teach but to introduce the authors, and to ease the student’s transition from the predictable Latin of grammar courses to the fluid and idiosyncratic Latin of great literature. Sienkewicz and Osborn’s close focus on these aims will make this book an important resource for teachers faced with the task of introducing Vergil. The book proper begins with a concise preface that explains to the teacher the format and use of the Legamus Vergil reader. After this, an introduction addressed to the student provides basic historical and literary information about Vergil and the *Aeneid. * The passages from the *Aeneid* follow. Each passage contains between 11 and 24 lines and is accompanied with copious help. Concise introductions to the literary context of the particular lines and brief grammar lessons introduce each passage. The grammar lessons, which cover one point of grammar for every passage read, are intended sometimes to review material already covered in the first years of Latin (e.g. participles or the independent subjunctive) and sometimes to introduce grammar unlikely to have been addressed early on (e.g. the middle voice). These grammar lessons are reviewed in the exercises that follow the passages. The presentation of the passages is further supplemented by copious grammatical and lexical aids, remarks on .gures of speech, and questions about meaning and interpretation. In support of all of this, the whole book ends with a well-organized grammatical appendix based on Bolchazy-Carducci’s *Graphic Latin Grammar* (2002), a list of .gures of syntax and rhetoric from Pharr’s edition of the *Aeneid,* and a pullout vocabulary, also from Pharr. An index of grammatical and vocabulary topics is provided for the teacher’s convenience. Teachers will greatly appreciate the economy and thoughtful organization of these pedagogical components. The grammar lessons are straightforward and useful. The presentation of figures of speech over the course of the text seemed particularly good. Questions about the meaning are thoughtful and will be good practice for the essay sections of the National Latin Exam. But students’ eyes will pass over grammatical and literary explanations to the innovative presentation of the lines themselves. In the initial presentation of the lines a variety of fonts has been carefully deployed to create a visual link between those nouns and modifiers that are difficult to connect with one another. Besides this, syncopations and gapped words are inserted, in round brackets, into the text, so that many difficult conventions and idiosyncrasies unknown to the student are instantly explained. Long marks are also used throughout the textbook. Students instantly understand that these fonts and brackets are visual cues to interpreting the text. Using the comprehensive grammar and vocabulary provided on the facing pages, they can sometimes begin to read right away. Teachers who, like me, worry that students might come to rely on such aids, should put their minds at ease. The visual aids, which are not overused in the first place, disappear completely after the first eight passages, and the final three passages are introduced without aids other than grammar and vocabulary. More importantly, each passage treated with aids is also presented, in the following pages, without aids, so that the student moves, for the same passage, from reading with aids to reading without aids. This is an important con.dence booster: students who use inserted fonts and brackets are aware that they are getting help. They need to know that these devices are helping them to learn the skills necessary for reading the original poem. Once they realize that they are in fact learning to read Vergil, and can see that the process is leading to understanding, they will hopefully develop patience for the laboriousbut worthwhile task ahead. “Furthermore, this book should inspire not only con.dence, but also interest, in the student. The passages of Vergil selected for treatment are both various and substantial. For book one they include the introductory lines (1.1-11), Aeneas’ speech to the Trojans after the storm at sea (1.195-209), Aeneas’ meeting with Venus on the coast of Africa (1.318-334) and the passage in which Aeneas watches the building of Carthage (1.421-440). For book two the passages comprise the attack of the two serpents on Laocoon (2.201-222), the death of Polites (2.526-546), the death of Priam (2.547-566), and Aeneas’ flight from Troy (2.705-729). Passages from book four are Vergil’s descriptions of Dido as she first falls in love with Aeneas (4.65-89), of Aeneas’ departure and her reaction (4.279-303), and of the death of Dido (4.642-666). The book thus contains passages that will be of interest to many students at the same time as it provides examples of an important variety of Vergilian modes. This LEGAMUS reader therefore constitutes an excellent introduction to the Aeneid, which will be most useful at the high school level. Students between 14 and 16 who are fortunate enough to have reached this level in Latin will .nd the initial ability to make sense of the lines a tremendous boost to their confidence. This summer I used this reader to help prepare a timorous 14 year-old who had been promoted to an AP Vergil course for this fall (2004). I divided the passages into short sections so as to provide for half hour homework assignments, suitable for the summer, and made no attempt to teach the whole book: we read about four passages. Despite the fact that we were so relaxed, the devices in this book worked very well. She was quite easily able to go from reading with aids to reading without them, and I believe she began the year feeling that she had read some Vergil and would be able to read more. (Initial reports from the classroom are positive.) In other words, for this student, the Legamus reader precisely ful.lled its purpose: it helped her move from the more predictable world of Latin 3 to the unpredictable world of real literature. The font cues were a welcome relief for this student, and most students this age will not feel any sense of insulted pride at using a variety of fonts to help them make the necessary connections, especially when the aids are as ef.cient and thoughtful as the ones provided here. Except for very small doses, however, I would be more reluctant to use this kind of text at the college level. I understand that it can be very useful to have a picture of everything that is dif.cult or missing from the lines of the poem, and to work from this toward a comprehension of the grammatical and poetic conventions of these texts. Some college teachers may wish to use the kind of strategies provided here to facilitate their .rst presentation of these matters, and all of us should look at this book to see if there are any useful methods we can add to our toolbox. It seems to me, however, that college students of Latin should not use such a textbook. 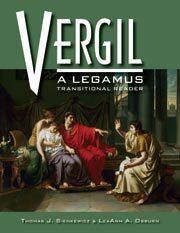 College students reading Vergil who have trouble with declensions should instantly review. They should not use aids such as these font cues even for a short time, since they cannot afford the slower pace granted to the fortunate high school student. The same goes for the practice of adding gapped words and .lling in syncopations. College students should be learning the conventions and principles behind these practices, and applying them for themselves from the beginning. It’s laborious, for teacher and student alike, and some students always decide that they’d rather do something else. But any mechanism that interferes with a mature experience of the poem harms the remaining students more than it helps those who might be attracted, for a bit longer, by apparent clarity. This is a wonderful book for younger students, who will have time to review all the grammar and conventions when they enter their Vergil courses. It is a wonderful book for teachers of all levels of Latin to examine, in order to add to their repertoire of teaching tools. It is less appropriate for undergraduate students. In terms of its production, this book is excellent. It seems durable, and the 8 1/2 by 11-inch size of the pages suits both the large font presentation of the passages and the capacities of high school binders. In sum, I recommend it to every teacher for its innovative and careful application of teaching aids, its clear explanations of salient aspects of grammar and poetics, and thoughtful comments on the poetry of Vergil. This book is intended for the Latin II or III levels where students tend to meet unadapted Latin for the first time. It has an Introduction to Vergil and eleven passages from Vergil selected from Books I, II, and IV of the Aeneid. It has a twenty-six page Grammatical Appendix which serves as a full Latin grammar based on Vergil, including information on meter, versification, reading Latin orally, and a separate list of Figures of Syntax and Rhetoric. There is no complete vocabulary, but there is a General Word List pull-out glued into the back of the book which is a copy of Pharr's list. Other material is taken from Pharr in the sections on versification and figures of speech. I used my Latin III class (who had never read unadapted Latin), consisting of eight students grades 10-12, as a classroom laboratory test group for the first section, Aeneid 1.1-11, which covers pages 1-10. I covered this lesson in a span of four consecutive class days which happened to consist, because of block scheduling and other activities, of about 140-50 minutes. The first part of the lesson is on: Before you read what Vergil wrote. This comprises about 12 lines of Introduction. (It is assumed the student has also read the full Introduction to Vergil on pp. xvii-xxiv). The second part of the lesson is: Keep this grammar in mind: Participles-Tense and Voice. It is followed by six practice participles for the student to identify tense, voice, gender, number and case. This grammar lesson seems to be inspired by iactatus 0. 3), passus (1. 5), laeso (1. 8), and dolens (1. 9). My students felt that this was a very random way to begin the study of the first eleven lines of the Aeneid. The third part of the lesson is: Helping you to read what Vergil wrote. This part begins with four questions about the first four lines of the Aeneid intended ,to help the student to translate the Latin. My students could not understand how they could answer the question without translating the Latin first. The first four lines are on the right hand page (p. 3), modified with words added in parentheses and some words in special fonts to try to show the relationships of the words. I noted there was no punctuation in line 1 after cano which confused some of my students. Above these lines is a short summary to put these lines in context. On the left hand page (p. 2) are Vocabulary and Notes. Both my students and I felt the Vocabulary and Notes should be combined rather than separate. The next part of the lesson are lines 5-11 on the right hand page (p. 5) in the modified format with added words in parentheses and words in special fonts to help show their relationships. Again on the left hand page (p. 4) are questions intended for the student to help translate the passage. Here there is an ominous sentence: "These directions will not be repeated again in this book." The first question reads: Lines 7-8. My students could not answer the question. A closer look revealed this was a mistake for: Lines 6-7. Again, the Vocabulary and the Notes were separated and hard to use, e.g. in the Vocabulary column 1. 11 were the principal parts and meaning of impello, but on the right Notes was the note on line 11 impulerit as a perfect active subjunctive in an indirect question translated as a past tense "forced." After these two pre-reading drills is a section on: Stopping for Some Practice Using English Derivatives (p. 5). This consists of 15 English words (with the Latin part of the root in bold) derived from Latin words in the first 11 lines. The student is expected to find the Latin word give the Latin meaning. My students were unsure if this "stopping" to check on English derivatives gave them any extra help in remembering the Latin vocabulary in context. We come to pages 6 and 7: What Vergil actually wrote: as it was. The unaltered Latin text is on the right on page 7. There are more Notes on the left hand side of page 6. Again, an ominous warning: "Notes and vocabulary supplied earlier in this chapter will not be repeated here. Keep this in mind since these directions will not be repeated here." This is new set of Notes to supplement the earlier ones since this is now an unaltered text. Also, figures of speech are now introduced in the Notes on page 6 and below the text on page 7: A Note about Figures of Speech. My students found it hard to go back and find the vocabulary and notes given in the "pre- read" passage to use in the "actual read" passage. This layout, I believe, is the weakest part of the lesson. I found it confusing as did my students. Pages 8 and 9 consist of the lesson: After reading what Vergil wrote. Section One is: Thinking about How the Author wrote: Gapping or Understanding Words. This lesson consisted of supplying understood verb forms and adjectives used as substantives. Section Two continues this lesson: Stopping for Some Practice: Substantives. Section Three is: Thinking about What you Read which consists of a list of seven questions on the first eleven lines. My students could not answer this questions without my prompting. Section four on page 10 is: Keep this Vocabulary in Mind: People and Places. This consists of a list of three roots "Lat", "Rom", and "Lavin" and the different words generated from them in the Aeneid. This section also seems random because it is list of Latin confusables for students who have only read the first eleven lines of the Aeneid. I think this would only add to their confusion, since the students using this book are not going to encounter King Latinus or his daughter, Lavinia. All in all, I think this is probably like most Latin lessons developed in the classroom and then published. They surely have worked fine for the teacher who developed them and has taught them over and over in their own classroom. They do not exactly transfer well to another teacher who must figure out the pacing and methodology, unless this teacher is willing to put in the time to work out the idiosyncracies of the presentation and layout. This layout, in particular, would be very hard for a students to do on their own without the constant assistance of a teacher. The Grammatical Appendix consists of over 19% of the pages used within the body of the text; yet, curiously, I found no cross references in either the Notes or the Vocabulary referring the student back to the Grammatical Appendix. I am not sure how the authors intended this section to be used. I must agree with my students that I also found the lessons of the first ten pages to be a luke-warm experience at best. However, there is no reason why an energetic teacher could not adapt this raw material and put a little order into the chaos with their own handouts, such as combining the vocabulary and notes sections into a running Vocabulary/Note list and adding their own cross references to the Grammatical Appendix.